Now a question. Do you know what unites people from Eastern and Western cultures, as they arrive to Tbilisi as tourists? You will never guess. It is a breakfast issue. For many travelers it is just weird that coffeeshops and cafes may start working at 10 or 11 and serve breakfast this late. 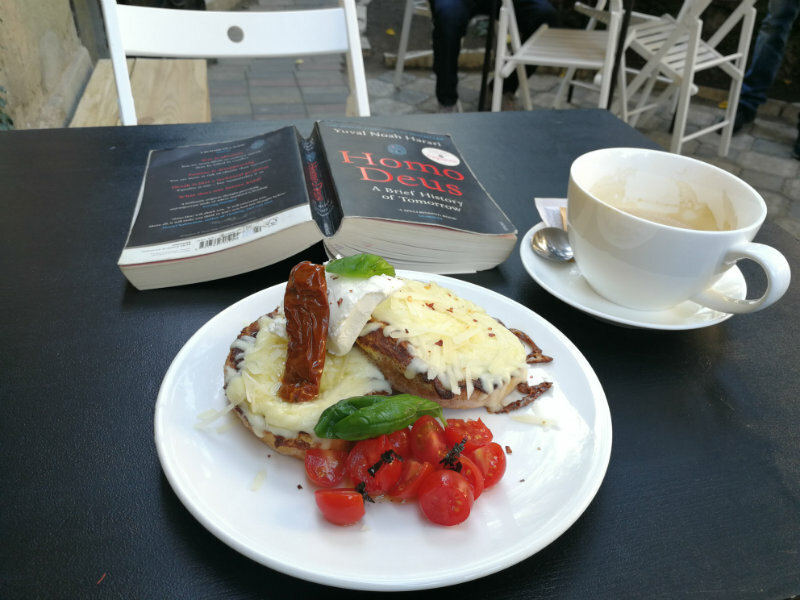 “Where can I have my coffee and pastry at 8-9 AM?” – that’s what I hear from people who do not stay at Radisson, Marriott or Rooms Hotel with their huge breakfast menu. My fellow breakfast seekers! I understand you, I hear you, my heart is beating with yours and my fingers already type some pieces of advice. 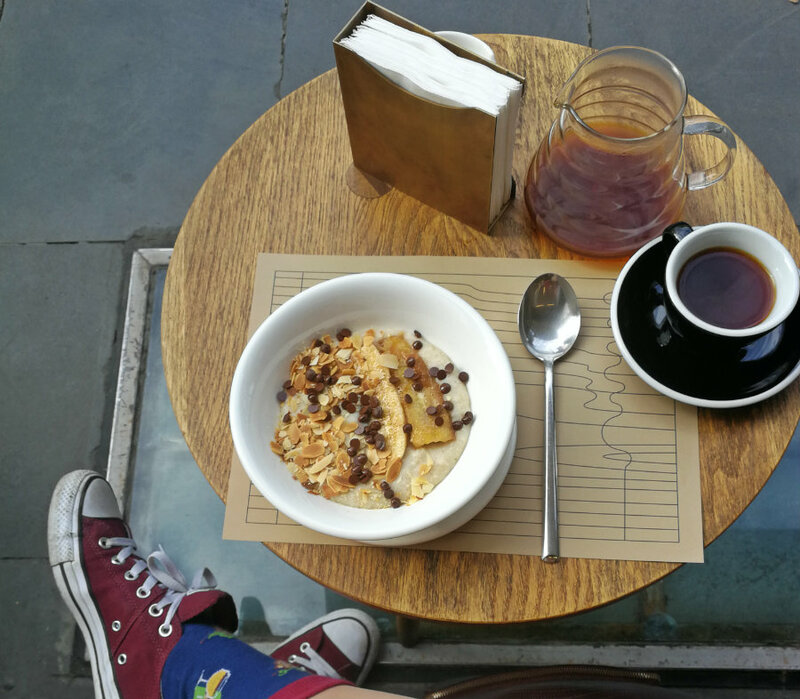 Times change, and Tbilisi finally gets its breakfast spots. I am concentrating on the “domestic” places only – no Shmendy’s and Shmunkin’ Shmonuts. 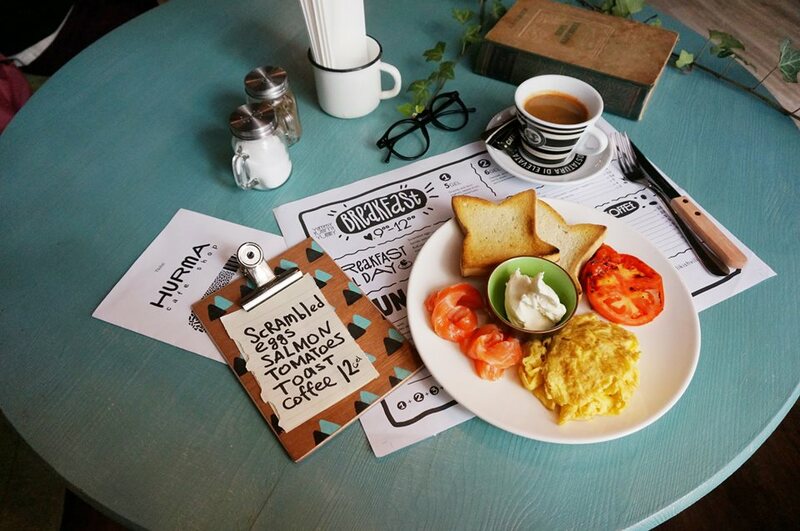 Hurma is an established breakfast place already. For the amount of 6 to 15 lari you can get granola with yogurt and berries, cottage cheese pancakes, scrambled eggs, porridge or English breakfast with coffee or juice. A nice Austrian style bakery with plenty of delicious breads, muffins, crepes and the “normal”, non-breakfast menu. Cozy and warm atmosphere and tempting flavour of freshly baked bread will make your morning. It’s open at 8 AM, what a blessing! Plus, if you buy coffee till 11 AM, you get a croissant or a bretsel for free. One word: porridge. I don’t know what my grandma would say if she would discover how much I can spend for simple porridge in a cafe during one month. But I love the oatmeal, the rice and the quinoa porridge, and I can’t say which is my favourite. Another favourite is double cappuccino. Coffee and croissants, fresh bread and various sweet baked goods. Better than some of the PAULs in Europe, I should say! One of the tiniest coffee shops in the city, PinPon is open at 9 AM! Third wave coffee – aeropress, v60, cold brew; delicious muffins, healthy sandwiches, seasonal smoothies… Dog-friendly, kids-friendly, very friendly! One of my favorite places recently. “Kikliko!” (ყიყლიყო!) is what the rooster screams in Georgia, and also the name of the traditional breakfast dish in our country. And a breakfast and brunch spot in Vake. The little outdoor yard is lovely, and even the omnipresent cars can’t destroy the mood. The menu is egg-themed, but I also tasted the cottage cheese pancakes and regular pancakes, too. Yummy! And, I should say, it’s a very Vake place the people from the other areas of Tbilisi would approve. So I recommend you to go there, if you feel like exploring not only old town, top-10 TripAdvisor cafes and “atmospheric corners full of lovely old ladies that treat you with free stuff”, as many guests and newcomers might put it. I was usually getting there a coffee from aeropress + croissant = 7 lari (€2.2). For another 5, you add a vegetable omelette that appeares to be of truly Gargantuan size. When the weather allows, sitting in the yard is a pleasure – because all the loud aspects of Tbilisi life are behind the wall, and you are just tucked there with your coffee and nobody sees you. Ah! It’s a coffee shop and creperie, with four tables inside and outdoor seating for the good weather. My favourite crepes are mozzarella + pesto and the nutella ones 🙂 This is one of the oases at the super touristic streets on the left bank of Mtkvari. To me, there is is creperie and two wine bars – the rest is, unfortunately, habibi-style tourist traps. The strongest side of this little cafe is the desserts menu – Kyiv Cake, Napoleon Cake, Carrot Cake, Chocolate Cake, Oatmeal Tart… I usually have to hold myself tight in order to avoid eating so much sweet. Luckily, scrambles and sandwiches selection is good, and coffee, too! Those are my favorite breakfast places in the city. Ah yes, the most obvious option is actually Entree – the Georgian-French chain of bakeries, which also operates in Azerbaijan. 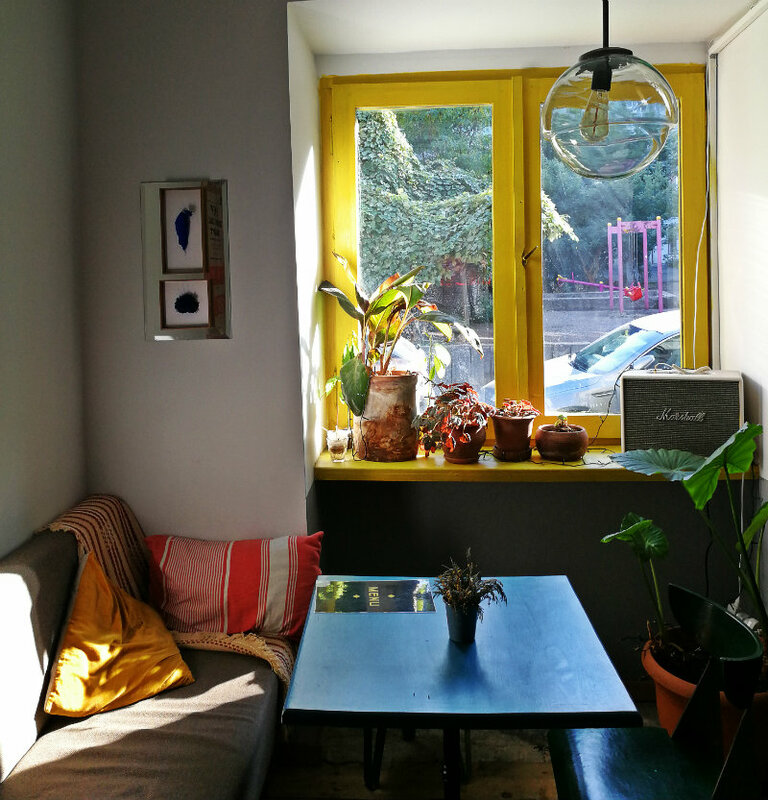 There are 10+ spots around Tbilisi, where you can get coffee, fresh juice, crispy bread and croissants, yogurt and many other things. Somehow I stumbled upon your site, and I just want to thank you for this post! I’ve been in Tbilisi for over a month now, and I really miss having a good latte and a “proper” breakfast menu here! The only place I’ve been frequenting (quite a lot) is entree, because their pastries are pretty good, and they have an affordable breakfast set before 11. It’s also good because it’s non-smoking.